That's right. 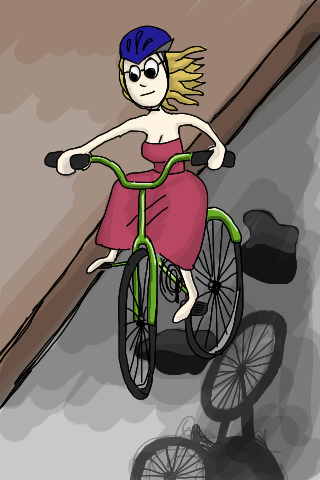 Somehow it seemed like it would be a good idea to bike to a date. I further compounded this insanity by feeling that I should wear a helmet (for safety) and flip-flops (not for safety - for convenience). Then I got all dressed up and decided after 15 dresses that I wanted to wear a tube dress. So I hopped on my bike, bike shorts peeking from under my skirt, and pedaled like mad. Soon my hair was crushed and slightly sweaty under the helmet. My flip-flops fell off twice. I am fairly certain I ate a bug or that one was at the least smeared across my left front tooth. I turned and headed down Bathurst Street. Bathurst Street is very bumpy. Some might even say that parts of it drop away into cavernous pits. Besides rattling my teeth, I almost lost my dignity and my dress more than once.